Assemble these guys and Hawaii will not miss a beat next year and well into the future. At the University of Hawaii's football camp, UH coaches work with intermediate and high school football players at UH practice fields. 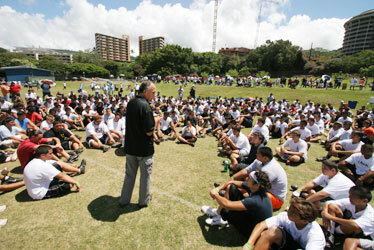 At the end of the drills one day last July, head football coach June Jones addressed the camp participants. Hawaii's Warriors showed up for every game. Our Warriors played before sold-out Aloha Stadium crowds twice. Do you think June Jones would have considered leaving if all the Aloha Stadium games were sold out? Having a world-class athletic program requires fans to show up consistently. All Hawaii fans would love a world-class program. This season Jones showed us we can do it. Now the fans can act on the Warriors' chant. Eo na toa, eo na toa e. "Respond fellow Warriors, respond with one's heart to the challenges that lie ahead of us." Show up. The program lives in the arena -- Aloha Stadium. Eo na toa, eo na toa e.
It saddens me to see that our state is locked in the same old bureaucratic mess. I am a middle-management Hawaii state employee, and I am sure that University of Hawaii athletic director Herman Frazier is not the only person to blame for June Jones' leaving. I would only hope our governor, our Legislature and our UH administration would be willing to step down as much as Frazier because nothing can be negotiated at that level for that kind of money without the Legislature and the Governor's Office allocating funds for such salary and facility improvements. I am sure Frazier was never given a definitive budget to work with. I hope our elected government officials realize the far-reaching economic effects of this error. Unfortunately, it appears everyone assumed that we had time on our hands (six months) to negotiate Jones' contract. Oh well, government, welcome to the entertainment industry. Hope we fare better next time. I just don't understand why people continue to take potshots at June Jones. UH professor Noel Kent's Jan. 10 comments about Jones being an "opportunistic football coach who has used UH-Manoa to advance his career" might be true but sound a little bitter. If there was anybody out there looking to "doing something substantial to make this university the kind of institution our faculty and students will be proud to devote their talents and energies to building," it was June Jones. I don't remember any professor at UH-Manoa within recent memory who has made a major positive impact or has brought the school to a national stage as Coach Jones and his football team have. Athletics instilling pride -- what a concept! I believe UH-Manoa can become this theoretical "jewel" in the middle of the Pacific. UH staffers and faculty must stop "hating" the success of one of their former own, and help build upon the achievements and groundwork that was laid. The discussion in the Jan. 10 letters -- "Salary could have paid for something lasting" and "The real loss is about faculty and students" -- begs for a response. Some on campus apparently view the world from the "us vs. them, zero-sum game" perspective. In this world whatever you get (and probably don't deserve) surely reduces what I get (and do deserve). The idea that our young people are exposed to this kind of thinking is a concern. It's great to stand up for your programs and believe in them. Leave it at that. Trying to connect the discussion to a "this instead of that" choice is misguided and inaccurate. Look at the athletic department's budget: It's balanced thanks to the football program and will look even better with the hard-won Sugar Bowl revenues. The college experience is about many things -- a primary academic focus and, among other experiences, a mutual sharing in college athletics. For many, athletic scholarship is the best route to improve one's lot in life. Certainly that's something lasting. Without UH's vibrant athletic programs, many student athletes would simply choose to go elsewhere. UH athletics also enjoys a special place of pride in the lives of all Hawaii's people, everywhere. So, let's knock off the fractious conversation about the football coach's salary and the relative importance of sports on campus. Hindsight is always 20/20, and it seems like looking back and pointing fingers is once again in vogue. Sure we lost a great coach in June Jones and finally ran Herman Frazier out of town, but the real questions are, Where do we go from here? and Does our state have the right leadership, vision and courage to not only look forward, but to finally move forward, as well? Unless the answer to the latter question is emphatically "yes," then we might as well add the $300 million face lift at the University of Hawaii to the long list of things we already need to fix -- our public schools, traffic on Oahu, potholes on our highways and byways, the eyesore that is Aloha Stadium and the world-renowned model of inefficiency and insecurity we call Honolulu Airport. Coach Jones' departure to SMU is a reminder that simply maintaining the status quo is never acceptable to those committed to continual improvement and winning. Aloha and mahalo, June Jones. It is a sad, sad day for Hawaii because we're losing not only an excellent coach, but also an excellent human being and leader. Hawaii will be eternally grateful for Jones' moral standards and demand for excellence and change. He made men out of boys and united our state in a way that we will forever be indebted to him. Jones touched our lives way, way beyond the football field. People like me gather with family and friends to watch the University of Hawaii play; we eat, drink, talk story and keep an eye on the keiki running around while the game is on. It's not all about the score; it draws people together to enjoy the game and each other. I hope Hawaii has given the coach back as much as he has given. If it were within my power, I certainly would not have neglected to recognize his worth, and would have kept him in Hawaii, no matter the cost. His concerns not being addressed for nine years is noteworthy. Was it gonna take another nine years to get fulfilled? No, Jones had to sacrifice what he loves and leave Hawaii for them to pay attention. How dumb is that? Jones is right to move on, though he leaves with a heavy heart. It's always hard to walk away from the things we love. No worries, we'll never forget Coach Jones. He will always, always remain in our hearts. Aloha. How can they be so clueless for so long? I'm appalled that so-called "key" state senators are appalled at the neglected conditions at the University of Hawaii (Star-Bulletin, Jan. 11). Where have these people been, and what have they been doing, to be so clueless as to the state of affairs at the university and across the state in general? June Jones has been complaining about the athletic facilities for years, and while I believe he used this as a convenient excuse for bailing out on us, no one can argue the validity of his complaint. But it doesn't stop at the university. In case no one has noticed, H-1 is full of pukas, and there's just so many patches you can put on patches before the road is a hazard. Hawaii's infrastructure is crumbling, and let's face it, despite the natural beauty as a background, the place is looking pretty damn shabby. And for a place whose livelihood depends on people wanting to come visit and spend money, looking shabby is a dangerous thing. Senators, get a damn clue! Parking regulations are exactly what they are -- regulations. I believe the Aliamanu Neighborhood Board has good cause to ask the Honolulu Police Department to enforce regulations to address issues of safety, ADA compliance and all other concerns. The residents are selfish to think that it is their right to do what they want. No notice is required; it's been written in black and white forever. So, you say you were parking that way for 25 years and only now received a citation. Well, lucky you. We have all done something we know was wrong, got caught, then acted as if we didn't know about it. Like speeding, "Was I going that fast?" and "I didn't know the speed limit was 25 mph." Please have consideration for everyone as we all must live in crowded neighborhoods. It is a wake-up call for all of us to think about getting rid of extra cars or taking the bus or even carpooling. Think green. In some countries you must prove you have a legal parking space before you even purchase a vehicle. How does that sound? Beware, the parking police are coming to your neighborhood soon. It amazes me to hear that those Times Super Market employees wouldn't accept a limit on their medical leave (Star-Bulletin, Jan. 11). The demands of those workers were unrealistic and laughable. In nonunionized private-sector occupations, unlimited medical leave is unheard of. Ron Kozuma of the Hawaii Teamsters and all union employees need to understand that all for-profit corporations are in the business to make money. People don't start a for-profit entity with the intent of giving people great medical leave and coverage. Those items are benefits created to satisfy regulation and attract/keep the best possible talent to a position. It doesn't matter if it's a mainland or Hawaii company. Kozuma should be ashamed of his sectarian, prejudiced, xenophobic and illogical statement. Workers should be rewarded and recognized for their accomplishments and what they bring individually to a company or group; not via collective bargaining. I praise Times for standing up and showing us that capitalism and individualism can prevail over collectivism. You want better union benefits? Move to France, where unemployment is high because of unions. I have seen several examples of the Board of Water Supply's new fleet of vehicles. Apparently someone there has decided to invert the company colors from a turquoise with white livery (logos and type) to the inverse, a white vehicle with turquoise livery. Bravo! This move will save taxpayers money because it seems far cheaper to obtain white commercial vehicles than it is to have these vehicles painted in a custom-mixed company color, the turquoise. Across the fleet, this should save a considerable amount over the long haul. I hope this move to economy will travel systemwide to include their annual "Water Quality Report," which contains an elaborate, 20-page, full-color promotional piece the monopoly sends to all of its nearly 200,000 users as a "feel-good" piece. As a graphic designer, I feel a more budget-friendly piece could convey the same information, with as much power and with greater sense of public responsibility.